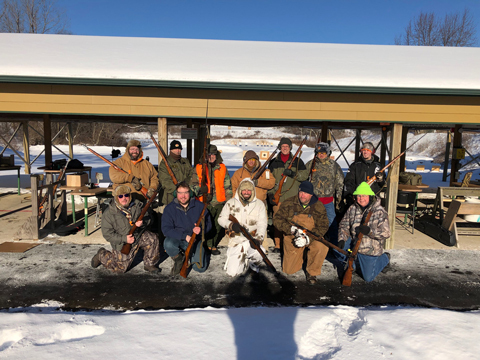 Provide a short winter match to encourage member fellowship and marksmanship at a time when the club is not normally active with organized outdoor activities. We commemorate the historical struggle of Finnish independence from the Union of Soviet Socialist Republics in a winter setting. 2019 MATCH WINNERS - TEAM RUSSIA !!! Participants must be members of Daniel Boone Conservation League. Team targets at 200, 100 & 50yds using period 7.62 x 54r (Mosin Nagant) bolt action rifle. Any Mosin-Nagant 1891 receiver or variant will be allowed. Including but not limited to Albania, Bulgaria, China, Finland, Poland, Russia and U.S. manufacture. As a team event, all rifles will be equal in advantage, mounted scopes are not permitted. Random selection of 'Team Finland' and 'Team CCCP' by drawing card at sign-n. Bench assignment is also by draw - Benches 1 thru 7 will be set for CCCP and 8 thru 14 for Finland. Match is three relays with each relay targeted at different yardage. All targets will be preset before match and all scoring will be after last relay. Scoring will be by team only - not by individual. Winning team earns bragging rights for one year. Review of procedures will be made prior to each relay to ensure proper safety. Relay #1 - 10 shots at 100 yards in timespan of 5 minutes. Separate targets will be set for each bench. Club provided wooden bench rest - sand bag only. Team will use individually placed targets similar to VMRM setup. No practice sighter rounds will be allowed as sighter rounds were not permitted to CCCP troops during the Winter War. Relay #2 - 5 shots at 200 yards in timespan of 5 minutes. Team CCCP will be firing on board #3 and team Finland firing on board #9. Club provided wooden bench rest - sand bag only. Relay #3 - 5 shots at 50 yards in standing team volley. One target per team set at 50 yards to be fired upon with each round by commands Ready (empty chamber), Load, Aim Fire. Only after completing all three relays will the targets be retrieved and brought to the clubhouse bar for scoring and announcing the winning team. Targets for match will be VMRM style 100/200yard small bore. Future matches could explore period representative targets pending board approval.